Finding titles of toddler books about kites is something many daycare providers, parents and teachers do in the spring and summer. Flying a kite is an exciting activity for children between the ages of two and five, and a book extends the excitement beyond the sunny summer days of kite flying. If I Were a Kite by Wendy Wax: Toddlers will love the small kite at the front of the book that fits on their finger. As the story progresses, they can make the kite soar through the pages until reaching the end of the book. Kipper's Kite by Mark Inkpen: This touch and feel board book for toddlers features a dog as the main character. The Kite by Mary Packard: Read about flying a kite in this short story. Little Lion's Lost Kite by Emily Bolam: Follow Little Lion as he hunts everyone for his lost kite in this lift the flap board book. The Funny Ride by Margaret Hillert: Read along as a child sees interesting things from a sky view when the kite takes him up into the air. One Windy Day by Jane Caraway: When Janey's kite gets stuck in a tree, her friends are there to help retrieve it. Corey's Kite by Hannah Roche: Learn about weather as Corey flies his kite. Kite Flying by Grace Lin: The plot in this story is fairly complex for toddlers, but the short sentences help make it simple as a family makes a dragon kite. Every toddler develops at varying rates, so some toddlers are ready for longer, more involved stories at an earlier age, while others are still engaged by short board books. Choose titles of toddler books about kites that are appropriate for your child's developmental age and not necessarily what you feel she or he should be doing. Books that are too simple or too difficult may curb his or her enthusiasm. Berenstain Bears: We Like Kites by Stan and Jan Berenstain: Follow Brother and Sister Bear as they fly kites in this fun rhyming adventure, perfect for toddlers through beginning readers. Dora and the Rainbow Kite Festival by Christine Ricci: Follow Dora as she and her friends get a kite to the festival using similar techniques as found in the popular television program. Kite-Tacular Adventure by Thea Feldman: Follow the stars of My Friends Tigger and Pooh as the Super Sleuths help Roo free his kite from a tree. Curious George and The Kite by H.A. Rey: Children will delight in following the fun-loving monkey as he gets swept away while flying a kite. Find the kite books listed above and more at bookstores and your local library. Librarians and teachers may have recommendations on books about kites, so ask them to learn more. For toddlers with a short attention span, look for children's poetry books that feature short verses about kites. Start by looking for books with spring poems. 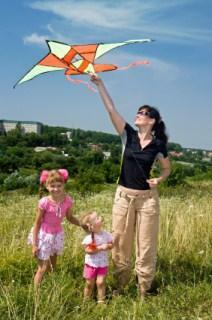 Kite flying is an exciting adventure for toddlers. Bring their enthusiasm inside and spark their interest in reading by sharing a kite book together.